While golf can be relaxing, it’s also a great workout for the body and the mind. Keeping the muscles strong and the mind sharp will pay off on the course. Healthcare professionals often tell their patients to eat well and to take supplements, but few provide details. 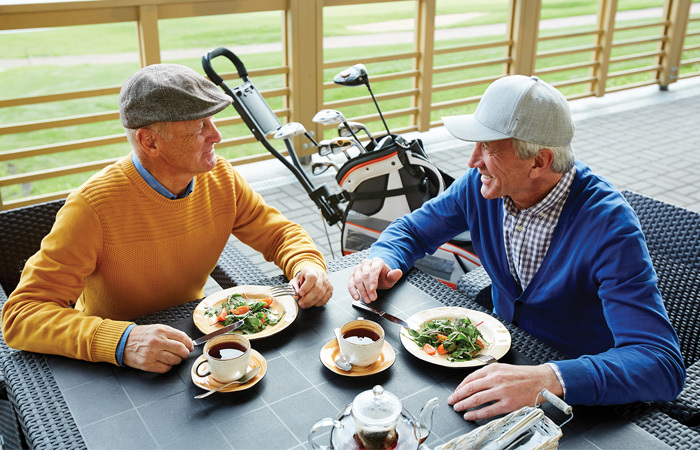 While every person’s needs are different, here are a five ways you can supplement your golf game with some much needed nutrition. Fruits, especially berries, are full of antioxidants, which in turn, boost the amount of collagen in the body. Collagen plays an important role in repairing tendons, skin, and blood vessels. Vitamin C, especially the high doses found in citrus fruits, helps the muscles flush out unwanted lactic acid. If you’re prone to stiffness or soreness the day after a game, pack an orange in your golf bag and enjoy after the 9th hole. Don’t forget, Vitamin C will also boost your immune system allowing you to spend more time on the course and less time fighting off illness. Eggs are one of the few foods that are loaded with Vitamin D, the necessary component for synthesizing calcium. Both are important to building strong bones and muscles. Vitamin D also helps reduce inflammation. Most people know that the sun aids in the body’s ability to make Vitamin D, but any dermatologist will tell you that you’re better off wearing sunscreen and consuming Vitamin D from a supplement or through good food sources like eggs, tuna and salmon. Swiss chard and kale are loaded with B vitamins. Feeling sluggish? B vitamins are just what the doctor ordered. Leafy greens are nutrient dense, meaning their loaded with the good stuff the body needs to stay healthy. Staying on the green will also help prevent muscle cramps, not to mention reduce your cancer risk and help regulate blood sugar levels. Ditch the coffee and replace it with a cup of green tea. Unlike coffee, it contains l’theanine which helps the caffeine metabolize slowly, preventing the crash that most caffeinated drinks can give. For those that stress about the game, L’theanine also creates a feeling of tranquility as it increases alpha-wave activity in the brain. Nothing can screw up a golf game easier than losing focus. A snack packed with amino acids and essential oils will turn things around. Pack a baggie of almonds or walnuts for a snack. It’s best to buy unsalted, since salt can raise blood pressure and cause fluid retention.